International Journal of Research in Health Sciences,2018,6,3,25-31. 1Associate Professor, 2Professor and Post Graduate Student, Department of Obstetrics & Gynaecology, Chalemeda anand Rao Institute of Medical Sciences, Karimnagar, Telangana, INDIA. Background: Preeclampsia is a hypertensive disorder specific to pregnancy that remains a significant cause of maternal and neonatal morbidity and mortality. Low dose aspirin has been reported to reduce the incidence of preeclampsia. Aims and Objectives: To determine whether treatment with aspirin reduces the incidence of preeclampsia among nulliparous pregnant women. 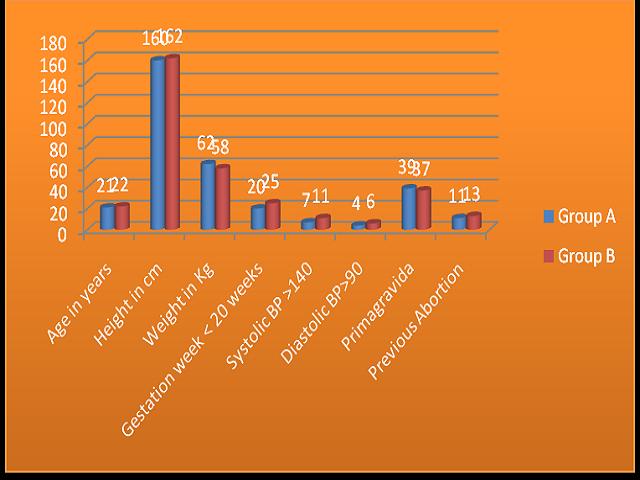 Materials and Methods: Our prospective study included 100 nulliparous, 13 to 25 weeks pregnant women. The total sample (n=100) was divided randomly in to two groups: Group A (n=50) received aspirin (60 mg plus starch) and Group B (n=50) received placebo (lactose plus starch). Measured variables were hypertension, preeclampsia, intrauterine fetal growth retardation and abruptio placentae. The observed data was tabulated and analyzed statistically. Results: We found almost similar demographic and clinical characteristics of the women in the two groups, except that more women in the Group P had a systolic blood pressure of 120 to 134 mm Hg when compared to Group A (P = 0.01). We also found a significant difference in weight of women among different groups (P=0.0007). We found the incidence of preeclampsia as 4% and 6% in group A and B respectively. We found almost similar rates of incidence of outcomes like oligohydramnios, premature rupture of the membranes, preterm and post-term delivery, rate of caesarean delivery, average gestational age, birth weight, length at delivery and the number of infants admitted to the neonatal intensive care unit. Conclusion: The incidence of preeclampsia may be reduced by aspirin use among healthy nulliparous pregnant women.